NEW YORK — A UK-based, George Soros-funded think tank where White House National Security Adviser H.R. 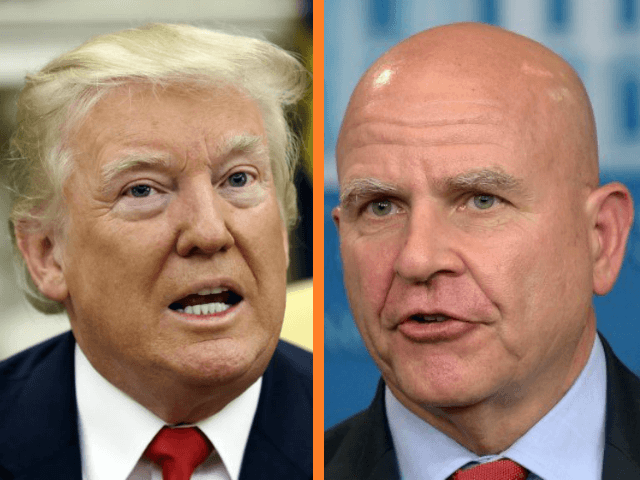 McMaster served for eleven years argued that the Iran nuclear deal is “working” and “policing Iran at gunpoint” – in other words, anytime, anywhere inspections of Iran’s nuclear sites – is a dangerous path. The International Institute for Strategic Studies (IISS) further claimed that President Donald Trump currently has “no grounds” to declare next month that Iran is not complying with its obligations under the nuclear accord. And it urged the Trump administration to stop the “adversarial atmosphere” surrounding the implementation of the nuclear accord with Iran. IISS has not responded to repeated requests from Breitbart News seeking clarification about McMaster’s work at the think tank, including any salary he may have received. The US wants nuclear inspectors to visit Iranian military sites. But “policing Iran at gunpoint” is a dangerous path, writes Mark Fitzpatrick. Indeed, despite Iran’s long history of allegedly obfuscating its nuclear program, Fitzpatrick claimed that anytime, anywhere inspections would be unhelpful. Some critics of the deal wanted inspectors instead to have the kind of “anywhere, anytime,” access that Iraq was forced to allow after its military defeat in the 1991 war. Good luck with renegotiating that, or the “zero enrichment” demand that proved unsuccessful during the George W. Bush administration. In continuing to pose these demands, some critics are honest enough to admit that they similarly envision policing Iran at gunpoint. Instead, he said, the current international system of first asking Iran for clarification on anomalies and then petitioning for a scheduled visit to an undeclared site is working. When suspicions or reporting anomalies arise, the IAEA’s procedure is to ask Iran for clarification. If the answers are not persuasive, the agency has the right to ask for access to undeclared sites that are not subject to regular safeguards inspections, including military sites. If Iran balks at such a request, the issue goes for adjudication to the eight member Joint Commission, where the US and its European allies comprise a majority. The procedures for dispute resolution are spelled out in the JCPOA, which improves upon the normal process under the IAEA Additional Protocol by setting deadlines. To date, Iran has not denied any access requests so there have been no disputes to be resolved. Fitzpatrick ignores that this procedure and the inability to conduct surprise inspections anywhere may provide Iran with enough time to hide possible illicit activity. Fitzpatrick further complains that an “adversarial atmosphere” puts the nuclear deal at risk, implying that such an “atmosphere” is coming from Trump administration officials. He says that Iran would be more willing to allow inspectors to visit its sites if only the “adversarial atmosphere” were tempered. “Such visits will be far more possible in a spirit of cooperation removed from the current adversarial atmosphere surrounding the JCPOA,” Fitzpatrick writes. A major component of Fitzpatrick’s argument is that unless Iran departs from its “adherence,” Trump currently has “no grounds for a finding of non-compliance” when the nuclear deal is up for U.S. re-certification next month. The Trump administration is required to register with Congress every 90 days whether Iran is abiding by the nuclear accord and whether the deal continues to serve U.S. national security interests. McMaster has considerable influence over the re-certification. In a July letter addressed to Trump and Secretary of State Rex Tillerson, Senators Tom Cotton (R., Ark. ), Ted Cruz (R., Texas), David Perdue (R., Ga.) and Marco Rubio (R., Fla.) cited four examples out of many from publicly known reports that indicate Iran has been violating the deal. One: Operating more advanced uranium-enrichment centrifuges than is permitted and announcing the capability to initiate mass production of centrifuges. Two. Exceeding limits on production and storage of heavy water, a substance needed to operate plutonium-producing heavy-water nuclear reactors. Three. Covertly procuring nuclear and missile technology outside of JCPOA-approved channels. There’s direct evidence of this, from German intelligence reports. Four. Refusing to allow IAEA inspectors access to nuclear-research and military facilities. As Breitbart News reported, IISS is heavily bankrolled by multinational corporate firms doing billions of dollars in business with Iran. IISS also quietly took in about $32.5 million in funding from Bahrain, a country whose constitution explicitly enshrines Sharia Islamic law as the governing doctrine. The funding from Bahrain, a repressive regime with a dismal human rights track record but also an important regional U.S. ally, reportedly amounted to one quarter of the think tank’s total income. A significant portion of the Bahraini funding reportedly pays for the think tank’s annual conference in Bahrain, the Mamana Dialogue. The original agreement between IISS and Bahrain to finance the conference contained a clause calling for the memorandum of understanding to remain confidential, according to the document, which was leaked by a watchdog and published by the Guardian newspaper last year. Breitbart News reported that another IISS donor is the controversial Ploughshares Fund, a George Soros-funded nonprofit identified by the Obama White House as central to helping sell the Iran nuclear deal to the public and news media. Soros’s Open Society is also a direct donor to IISS. The Soros-financed Ploughshares’ involvement in selling the Iran agreement to the public was revealed in an extensive New York Times Magazine profile of Obama’s former deputy national security adviser, Ben Rhodes, titled, “The Aspiring Novelist Who Became Obama’s Foreign-Policy Guru.” The article contains interviews with Rhodes and scores of top Obama administration officials. It has also financed the International Crisis Group, a small organization that boasts George Soros and his son Alexander on its board and where Malley now works as vice president for public policy. As Breitbart News reported, the IISS added George Soros’s Open Society Foundations and the Soros-financed Ploughshares group to the list of donors on its website in response to a request from this reporter on the matter. During a Breitbart News investigation last month, neither the Open Society or Ploughshares were listed on the IISS website page titled “Our Funding” despite this reporter finding literature from those two groups documenting their financing of IISS. Also, both groups were listed in an archived version of the same IISS donor’s page. Following a request for comment, both the Open Society and Ploughshares groups were added back to the IISS donor page. As well as the Open Society Foundation, we also accidentally removed the Carnegie, McArthur, and James Foundations, as well as a number of governments and corporate supporters, when we updated the page ten days ago. Your question brought this to our attention and the listing has now been corrected. Speaking at a recent event held by the Ploughshares Fund, former Secretary of State John Kerry implied that McMaster is the best bet for keeping the nuclear agreement alive, according to a Ploughshares Fund description of the June 5, 2017 event. McMaster is listed on the IISS website as serving as a former consulting senior fellow on the following issues: Military history, civil-military relations, development and security, and conflict and conflict prevention. IISS, meanwhile, has supported the Iran nuclear agreement and defended Tehran against reports it has violated tenets of the deal.